The 2018-19 NCAA hockey season is underway, and we’ve already been surprised. A number of upsets occurred this past week, including the UMass Minutemen topping the No. 1 ranked Ohio State Buckeyes over the weekend. 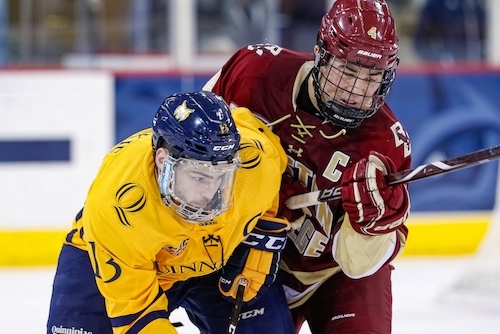 Meanwhile, the Quinnipiac Bobcats were able to shut out the Boston College Eagles as the Union Dutchmen swept a tough Northeastern Huskies team. While it is early in the season, the first handful of games can resemble the gap between moving on to the national tournament and not. Some of the best teams in the league were knocked off their pedestal this weekend, and they will need to figure out what went wrong and address it quickly if they hope to bounce back before it’s too late. US College Hockey Online (USCHO) ranks the top-20 schools in the nation every week. There were a number of big shifts on the totem pole, including Notre Dame moving to the top and Union jumping up nine spots. UMass and Quinnipiac, both of whom were previously unranked, now find themselves on the big board. The Minutemen marched into Columbus, Ohio to do battle with the Buckeyes on Friday. The top-ranked school in the country, OSU, was looking to coast by a UMass team who has low expectations for the 2018-19 season. They were surprised by a 6-3 defeat—their first loss of the campaign. UMass came out flying, scoring three unanswered goals thanks to senior Brett Boeing, sophomore John Leonard, and freshman Bobby Trivigno. It was just the start the Minutemen needed. They wound up riding that momentum throughout the game, outshooting the Buckeyes 38-27. But OSU wasn’t going to let the Minutemen march past them with ease. Columbus Blue Jackets prospect, freshman Carson Meyer, notched two second-period goals—the second of which was assisted by senior Dakota Joshua and junior Tanner Laczynski. Laczynski danced down the right wing from the point and fired a pass across the crease. After chaos ensued out front (which resulted in Joshua getting his stick on the puck) Meyer found himself alone with possession and fired the disc into the goal. UMass wasn’t finished, however. Philip Lagunov responded with a power-play goal early in the third frame that went on to be the game-winner. 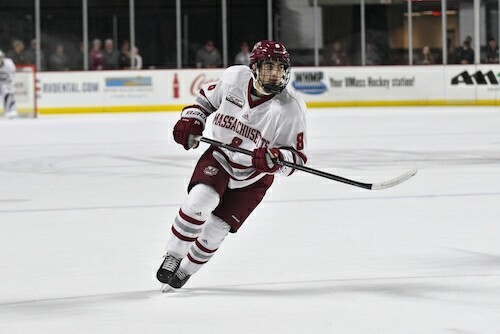 After a response by Joshua, Trivigno scored his second goal of the game followed by sophomore defender Cale Makar’s empty-netter to seal the deal. Makar was subsequently named the Hockey East Player of the Week for his four-point weekend in Ohio. It is the second consecutive week in which the defenseman has taken home the honor. Makar (eight points) and Trivigno (six points) now lead UMass in scoring. Thus, OSU was troubled by a startling loss in their home opener. Though they were able to rebound with a 3-1 victory over the Minutemen the following night, they certainly have some things to address – namely getting off to a quicker start – with conference rivals like Notre Dame and Wisconsin on their November schedule. After this weekend, UMass now has a 4-1-0 record and is ranked No. 16 by USCHO. Among failures by some of the top dogs in the Hockey East early on, the Minutemen have an opportunity to soar to the top of the standings within their conference. Quinnipiac also made headlines this past weekend by shutting out a team that was originally expected to compete for a national title. The winless Eagles were thirsty for a victory over the unranked Bobcats. However, Quinnipiac was already off to a 2-0-0 start and was determined to go 3-0-0 for the first time since the 2015-16 campaign. Bobcats senior defenseman Chase Priskie scored the affair’s first and only goal. On a 5-on-3 bid in the first period, Priskie sent the puck down from the right point to fellow senior Brandon Fortunato who was waiting for the pass at the goal line. After drawing in an oncoming penalty-killer, Fortunato returned the puck to the Washington Capitals prospect, who sent a one-timer into the top-right corner. From there, Quinnipiac played lights-out defense. They held the Eagles to just 21 shots, all of which were saved by sophomore goaltender Keith Petruzzelli. The netminder’s first career shutout adds to an impressive stat line for the Detroit Red Wings prospect which includes a 3-0-0 record with a 1.34 goals-against average (GAA) and .931 save percentage (SV%). Thanks to the team’s upset, the Bobcats are now ranked No. 20 in USCHO’s most recent Division I poll. Subsequently, the Eagles, who were ranked No. 12 in USCHO’s preseason rankings, have slowly fallen down the chart and are now rendered unranked. Northeastern hosted Union this past weekend, and on Friday the home team got off to a hot start: two goals by senior Lincoln Griffin and freshman Tyler Madden in the first period gave the Huskies an early lead. The Dutchmen stuck back late in the frame, however. Senior forward Brett Supinski tallied an even-strength goal followed by a short-handed goal just two minutes later to tie the game. Union found itself down a man far too often. The team took six minor penalties altogether and thus allowed two power-play goals—the second of which was inked by Liam Pecararo in the second period. On the other hand, Northeastern took just two penalties, but it was senior defenseman Eric Williams’ interference minor at the end of the second frame that proved fatal. With just three seconds left on the infraction, Dutchmen senior Sabastian Vidmar potted his second goal of the season. After a long back-and-forth third period, senior Cole Maier tallied the winning goal just 23 seconds into overtime. Saturday’s affair didn’t require an extra period, and this time around it was Union that came out with two early goals. Vidmar potted one on the power play, and sophomore Jack Adams registered another at even strength to give the Dutchmen a 2-0 lead heading into the second period. After scoring his goal, Adams went on to take a five-minute major for hitting from behind. Northeastern took the opportunity and ran with it: Pecararo cradled the puck down low before sending it across the zone to Ryan Shea, who was wide-open at the left point. Shea skated it to the top of the face-off circle, drawing in two Union penalty-killers before shooting the puck wide towards junior Grant Jozefek. The eventual goal scorer deflected the puck into the net to cut the Dutchmen’s lead in half. But it was Union that went on to score the game’s final goal: Vidmar potted his fourth of the season in the third period to solidify the 3-1 victory. It was a pretty even matchup, however, with both teams registering 32 shots. However, the Dutchmen’s sophomore goaltender Darion Hanson was up to the challenge. He made 68 saves against the Huskies this weekend which was good enough for a 1.99 GAA, a .944 SV% and two wins. Union rounded out a weekend of college hockey that featured a number of upsets. Some of the big-named teams are off to a slow start. Meanwhile, UMass, Quinnipiac, and Union all worked their way up the totem pole for their surprising victories—the latter of whom is now ranked No. 11 by USCHO. It was an exciting weekend of hockey that could foreshadow more stunning results as the 2018-19 NCAA Hockey season moves forward.